Do you love the glamour and entertainment of an evening at the theatre but don't always have the budget to pay for the top-price seats? With a Theatre Tickets Direct promo code you can get fantastic deals on tickets to a brilliant selection of shows throughout London. So whether you want to see a musical at the West End or perhaps a ballet or an opera, a Theatre Tickets Direct promo code can save you money when you book. 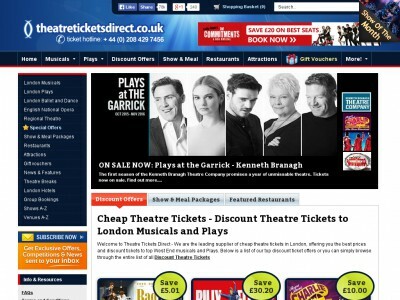 Theatre Tickets Direct are on official online retailer for tickets to theatre shows in and around London. With over 7 years' experience in the business, they really know their stuff when it comes to sourcing the best tickets, for the best shows, at the best prices around. At Theatre Tickets Direct they understand that a trip to the theatre in London is an unforgettable experience, whether you live in the city or you're just visiting on holiday. From the excited atmosphere of the foyer to the magic of the show, nothing beats an evening out in the West End – and Theatre Tickets Direct are committed to making that experience the best it can be. With over half a million satisfied customers, they're the experts in organising memorable trips to Theatreland for groups of all ages and tastes. Because they have spent several years building up close relationships with theatres and suppliers, Theatre Tickets Direct are able to offer their customers fantastic discounts on tickets prices and a great range of seats for you to choose from. And because they've visited all the theatres and seen all the shows for themselves, they're in a fantastic position to provide you with help and advice whether it's choosing a show to suit the whole family or picking which seat has the best view. Want to combine your London theatre visit with a stay in a hotel or dinner in a local restaurant? Theatre Tickets Direct can book you accommodation in a choice of hundreds of London hotels located close to the West End. They also offer an exclusive 'Show and Meal' package which combines top tickets to your choice of show with dinner in one of the area's fantastic local restaurants. Whichever package you choose to book, you can relax knowing that you're in safe hands – Theatre Tickets Direct are approved by STAR, so you're always guaranteed a genuine product. Want to get booking your next theatre trip with Theatre Tickets Direct? With a Theatre Tickets Direct promo code you can enjoy fantastic savings on tickets to top West End shows. So whether you want to kick your feet to a musical or unwind at the opera, a Theatre Tickets Direct promo code will help you plan a fantastic night out without breaking the bank. Fantastic value 'Show and Meal' packages available including dinner at local restaurants. Browse our website until you find a Theatre Tickets Direct promo code that suits you, then navigate to their website to make a booking. Choose a date and time and click 'Book'. Choose a seat and click 'Add these to basket'. Enter your Theatre Tickets Direct promo code in the box provided and click 'Submit'. If you've enjoyed shopping at Theatre Tickets Direct, you might also like to check out more great deals on nights out and more at sites like London Pass or Lovetheatre.com. Or, if those aren't right for you, you'll find plenty more deals to browse in our Others section. Navigate to their website to make a booking. Click 'Checkout using a credit/debit card'. Tickets can be delivered either to your home address or to a hotel of your choice, free of charge. Need to speak to the team at Theatre Tickets Direct? Whether you have a question about your booking, want to know more about a specific theatre or simply want to find out more about how you could make fantastic savings with a Theatre Tickets Direct promo code, you can contact the Customer Services department by telephoning 0208 429 7456. Want to find out more about great nights out with Theatre Tickets Direct? The company maintains a profile across all your favourite social media networks. Follow them for access to lots of exclusive content including promotions, show reviews, industry news and much more. You can also use these pages to find out more about saving money with a Theatre Tickets Direct promo code. Don’t forget to check them regularly, as you can never be sure when a free Theatre Tickets Direct promo code might be waiting for you! Buy now online at www.theatreticketsdirect.co.uk. My husband and I love to go to the theatre, but can't always afford to go as often as we'd like. That's why I was so delighted to discover a Theatre Tickets Direct promo code online. At theatreticketsdirect.co.uk you can get amazing prices on all of the top West End shows – and get an even bigger discount with a Theatre Tickets Direct promo code. With my Theatre Tickets Direct promo code I got a fantastic deal on two tickets to see Billy Elliot, with dinner included too! So why not treat yourself with a Theatre Tickets Direct discount?